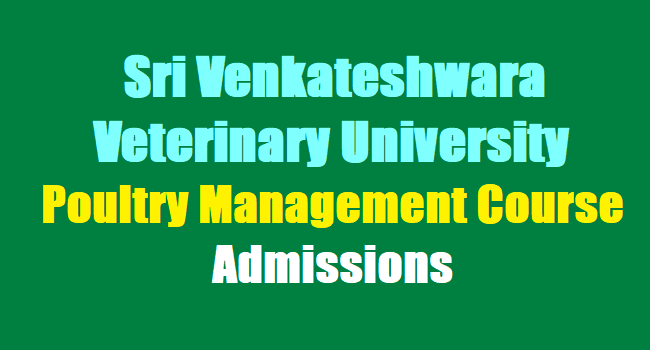 SV Veterinary University Poultry Management Course admissions 2017, Sri Venkateshwara Veterinary University Admission Notification for Certificate Course in Poultry Management for the year 2017: Applications from eligible candidates belonging to the state of Andhra Pradesh sponsored by A.P.Poultry industry are invited for admission into Certificate Course in Poultry Management for the first batch for the year 2017 offered at Department of Poultry Science, NTR College of Veterinary Science, Gannavaram, Krishna district a constituent College of Sri Venkateswara Veterinary University,Tirupati. Duration of the course: 6 months (2 months course work at college + 4 months intensive hands on skill training in poultry farms and hatcheries). Accommodation: There is no hostel facility. Candidates have to make their own arrangements. How to apply: The applications shall be downloaded from www.svvu.edu.in The duly filled in application along with attested copies of required certificates and a crossed demand draft for Rs.500/- towards Registration fee drawn on any Nationalized bank favouring “Certificate Course, Dept. of Poultry Science, NTR CVSc” payable at Gannavaram,Krishna District should reach the “Professor and Head, Department of Poultry Science, NTR College of Veterinary Science, Gannavaram- 521 102 on or before 13-7-2017 by 4.00 PM either in person or by Registered Post with Acknowledgement Due. Applications received after this due date will summarily be rejected. Candidates should send their applications through their sponsoring Poultry Industry/ firm failing which they will be summarily rejected. The University is not responsible for any postal delay.